Along with stages two and three of the Green Chain Walk I walked this stage on Sunday 9th January 2011, a lovely bright winters day with excellent visibility. 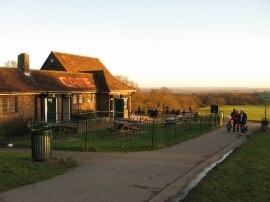 Stage four of the route is actually shaped like the letter T with two finish points, stage 4a running between Charlton Park and Bostall Woods with stage 4b leaving this route midway at Plumstead Common and heading south to Oxleas Meadows. 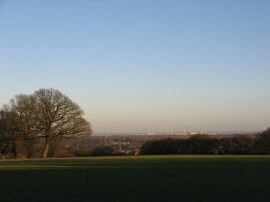 My GPS said I had already walked 9.36 miles when I reached the start point of stage four in Charlton Park, photo 1, having walked there from the end of stage 3 at Oxleas Meadows. 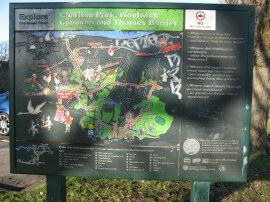 Here, the Green Chain Walk the signpost at the start, photo 2, said it was 3 and ¾ miles back to Bostall Woods. Leaving the park the route heads to the right up Cemetery Lane, where rather unsurprisingly there is a rather large cemetery to the left, photo 3, before turning to the left along Charlton Park Lane with the buildings of Queen Elizabeth Hospital on the right. Crossing the top of Repository Road the route continues ahead along a broad green patch of grass running parallel with Ha Ha Road, photo 4, with the Woolwich Common and Shooters Hill rising away on the right. 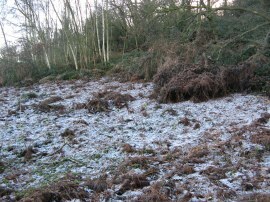 The Ha Ha itself to the left of the path is now a listed monument. Continuing ahead as the route approaches the South Circular Road with its wall of flats heading off up the hill along the edge of the road. 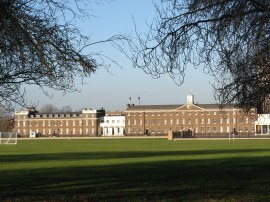 The rather ugly buildings were in stark contrast to the fine old buildings of the Royal Artillery Barracks, photo 5, across the playing fields on the other side of the road. 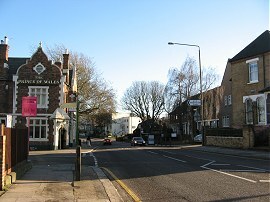 Crossing the South Circular, the Green Chain Walk continues ahead along Nightingale Place until the Prince of Wales Pub is reached, photo 6, where the route heads briefly to the left down St Margarets Brook Grove before heading to the right behind the pub on a path running through a small area of parkland which marks the edge of Plumstead Common. Bearing away from the main road the route heads across Blendon Terrace, continuing ahead through another area of park, past some tennis courts and along a hedge lined path that leads to reach Waverley Crescent, photo 7. 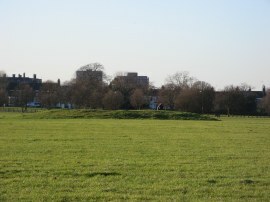 This is the point on Plumstead Common where stage 4 of the Green Chain Walk splits into two with stage 4a continuing ahead to Bostall Woods and stage 4b heading to the south towards Shooters Hill. 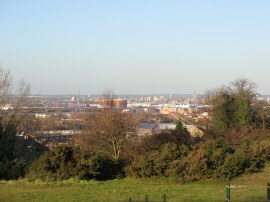 In order to complete this stage of the walk I first continued ahead back towards Bostall Woods. Crossing Warwick Terrace the route passes the remains of an old mill, then continues ahead along the left hand edge of the common before coming to a steep sided valley known as the Slade which the route heads down along a flight of steps, photo 8. 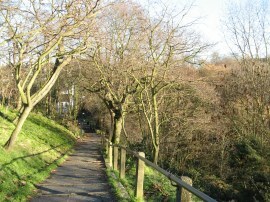 Having descended down some 90 steps the path then passes Slade Pond at the bottom of the valley before heading up a similarly steep flight of 99, sometimes rather crumbly tarmac steps on the other side of the valley. Reaching the top of the steps the route crosses Lakedale Road and heads to the left along the edge of the road with broad views opening up across the Thames Valley, photo 9. 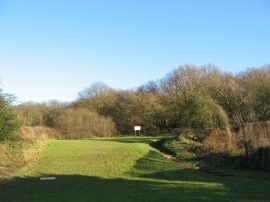 The route bends to the right around a play area then continues across the common, descending down hill by some trees to cross a small gully. Bearing to the right the route then crosses Winn Common Road. 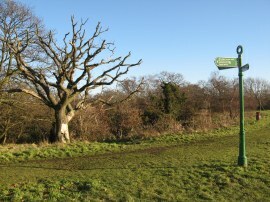 Here I went slightly off course as I could see another Green Chain Walk finger post ahead and thus headed directly towards this, crossing diagonally across another open patch of grassland on Winns Common near the summit of Bleak Hill where there are the remains of a small burial mound over to the right, photo 10. The correct route however follows the edge of the road along to the left before heading to the right up the far side of the open space rather than cutting directly across. 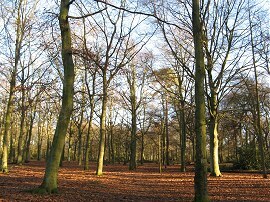 From the top of Bleak Hill, photo 11, the route heads down a flight of steps which heads into a patch of woodland, Great Bartlett Wood, the shaded areas within the trees still covered in a thick layer of frost, photo 12. The path then heads steeply down through these trees to reach a road. Crossing Wickham Road the route heads to the left, joining an open grassy space between houses, photo 13. 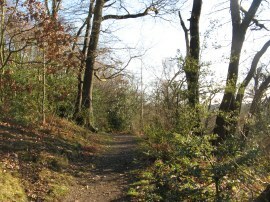 This path is followed round to the right as it starts heading uphill into Bostall Woods. The route then heads quite steeply uphill to join a very pleasant stretch of path winding its way through the woodland, photo 14. Approaching the top of the hill the path levels off and heads through an area of less densely planted trees, photo 15, the ground still carpeted in golden fallen leaves. A short distance further the path reaches Longleigh Lane which marks the end of section 4a of the Green Chain Walk, photo 16. Back at the lane the GPS said I had now walked 12.8 miles which made this part of stage 4 3.44 miles in length from the start point at Charlton Park. 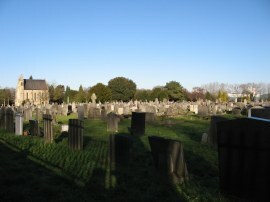 In order to complete all of stage 4 I then had to turn round and retrace my steps the 1.8 miles back to Plumstead Common to pick up the start point of route 4b by Waverley Crescent. 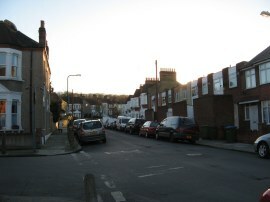 Once back at Waverley Crescent, photo 17, I headed to my left and reaching the end of the road followed the route as it crosses Plumstead Common Road and heads up Ennis Road, photo 18, as the Green Chain Walk starts its ascent of Shooters Hill. Reaching a slightly raised stretch of footpath besides Ennis Road the route turns sharply to the left on itself heading uphill along Upton Road and at the end of the road continues up a small flight of steps. 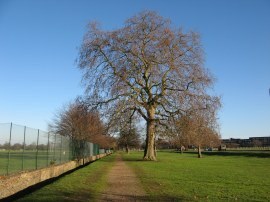 These head uphill through an area of scrubby trees to reach a more open area of parkland on the slopes of Shooters Hill. 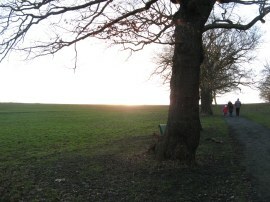 I followed the the path into the setting sun as it heads up towards the top of the hill along a tarmac footpath, photo 19, before turning to the left along a grassy path that runs alongside the backs of houses. From here there were once again excellent views across the Thames valley down towards Dartford and out over Essex including much of the area I had been walking over earlier, photo 20. 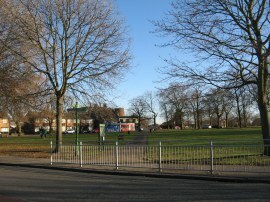 Reaching the end of the park, the route passes through a metal gate and along an enclosed stretch of footpath to join a road where the Green Chain Walk heads to the left along Kinlet Road. The route heads steadily uphill and continues ahead into Eaglesfield Road, passing some tennis courts on the left. Reaching the junction with Foxcroft Road the route bears to the right across a trackless patch of grassy ground at Eaglesfield Recreation Ground which is close to the summit of Shooters Hill at altitude 130m (427ft). 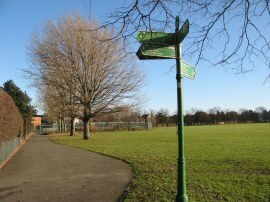 The route heads directly over the grass towards the water tower directly ahead before reaching a fingerpost where the route heads to the right, skirting round the back of a small play area to reach Cleanthus Road where the route heads to the left. 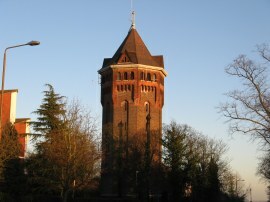 The route heads past the iconic water tower, photo 21, then turns to the right for a short distance along the A207 Dover Road before crossing the road into Kenilworth Gardens. A few yards down Kenilworth Gardens the route heads to the left down Crown Woods Lane. The Green Chain Walk heads down this lane and through a small parking area to reach the café back at Oxleas Meadow, photo 22, which marked the end of my walk along stage 4 of the Green Chain Walk. 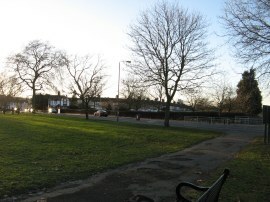 The GPS made the length of the section 4b 1.8 miles from Plumstead Common. Together with the 3.44 miles I had walked along stage 4a this made the total length of the stage 5.24 miles. 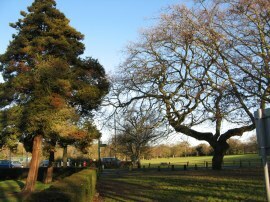 Although I had now finished my walk along the Green Chain Walk for the day I still had to get back to the car. 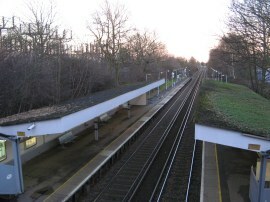 Thus I set off from the cafe retracing my way along the end part of stage three before heading to the right along stage 6 towards Falconwood Station, photo 23, from where I got the train back to Erith having walked a total distance on the day of 17.4 miles. Although this required a change of trains in Dartford the journey only took half an hour. This had been a very satsifying walk, undoubtedly helped by the excelent weather conditions. There was no new ground for me but it had been nice to revisit a number of interesting places I had not been too for a number of years.